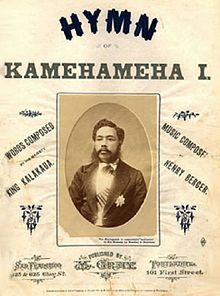 It was adopted as the national anthem in 1876, replacing Liliuokalani's composition He Mele Lāhui Hawaiʻi. It was the adopted song of the Territory of Hawaiʻi before becoming the state symbol by an act of the Hawaiʻi State Legislature in 1967. The melody is reminiscent of "God Save the Queen" and the Prussian anthem "Heil dir im Siegerkranz". "Hawaiʻi Ponoʻī" is commonly sung at sporting events in Hawaii, immediately after the U.S. national anthem.